Small stories we have experienced on our trip and stimulate for smiling and reflexion. Danger recognised, danger banned (PERU): Apparently the Peruvian tourism authority has already recognised that the so-called "Gringo discount " is no rarity. 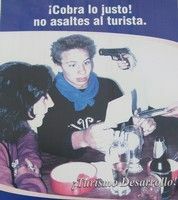 In a clarification campaign the Peruvians are asked from the tourists to require the "correct price" and not to attack the "tourists". In the tourist centres the campaign already seems to fruchten, because the Peruvians in Puno, Cusco and Huarz were substantially friendlier and more honest than in the remaining Peruvian Andes. Fill up just briefly energy! (PERU): The small housing development in the stream power station below the canyon del Pato works with the nice small houses and the palms like a small holiday's settlement. Maybe the whole is here a test project of the Peruvian tourism association under the motto: "Fill up just briefly energy"! 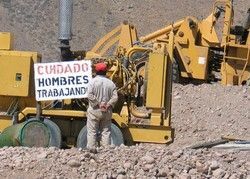 Cuidado Hombres Trabajando! (BOLIVIA): Esteem men at the work!!! 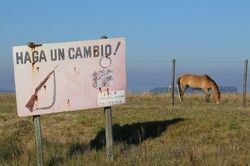 "Haga un Cambio" (URUGUAY): "Structure a change!" and makes instead of shooting the animals with the gun, rather a few snapshots with your camera of them. The best fruits (CHILE): The best fruits are always they, which not, or only hard are to be reached. 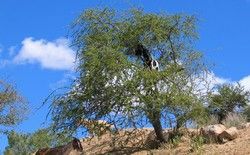 However, as a right Schleckermaul one undertakes of course all only conceivable efforts to come to the best little sheets, and thus this nanny goat climbed without further ado in a tree. Holy cows!!! 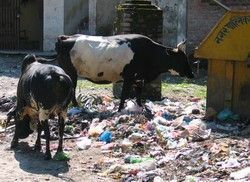 (INDIA): Cows are valid in India though as holy, however, unfortunately, they often do not behave completely so holy. Instead of grazing on juicy green meadows they rather rummage through the big-city garbage for food leftovers. 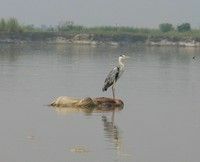 If one is a matter of delivering something with a few bananas along a cow without her of it, it can happen, that they one with her horns attakiert, as it has happened us several times in Rishikes! Time?! (LADAKH): In Ladakh there is a history of a Norwegian scientist in itself a woman about her sister deplored: "My Schwesterlebt now in Leh and has all newfangled Gewraete which save so much time: a cooker, an electric heating, a washing machine, a car and a phone. However, if I comes visiting them sometimes them no time to maintain itself with myself sometimes...."
Respect??? 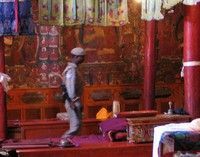 (LADAKH): The Buddhism is a religion which rejects the use of force in principle. 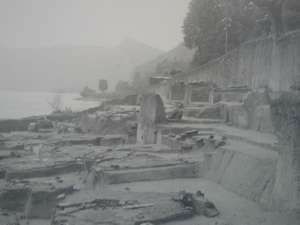 Thus many monks leave her chamber during the summer months hardly only to prevent that they kill no insect accidentally. Accordingly I have seen it also as a massive sign of intolerance when I saw a few Indian (presumably Hindu) soldiers who swaggered with her guns through the prayer space of a cloister! 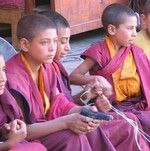 Armed monks (LADAKH, NORTHERN INDIA): Maybe inspires from the armed soldiers who visited the prayer space, this Buddhist novice bought to himself a water pistol which he carried during the cloister festival of Phyang proudly with himself! Ladakh (NORTHERN INDIA): If one visits Ladakh one is always confronted with two worlds. On one side the Ladakhis with her ancient culture, and on the other side the tourists with her western culture (not to say around consumption terror). In 1974 Ladakh was opened by the Indian government for the tourism and since then more and more western tourists flow out from year to year in the mountain world. 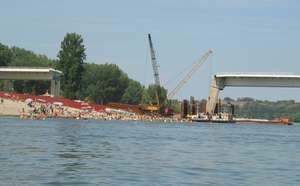 The ecological and sociological changes are hardly to be overlooked. Especially admirably I found over and over again with which equanimity accepting the Ladakhis the change of her native country and her culture. 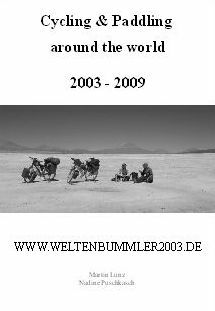 Merely many "West Germans" stir about the destruction of nature and culture by industrialisation, and mass tourism on (although they are, nevertheless, themselves a part of that). Also for me the tourist masses, after the quiet times in Iran and Pakistan, how were a small shock. It is really unbelievable if one sees, like a group of Japanese to a Ladakhi which, peacefully his prayer mill rotary, reciting on the landing before his house sits with cameras with gigantic zoom lens from some 1 metre of distance flashes in the middle in the face. Instead of reacting angry, prays of the Ladakhi, nevertheless, without any reaction simply wide. 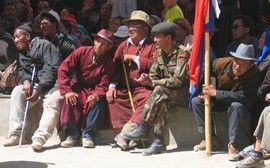 Although I always a friend of change am, nevertheless, I fear almost that one will have in 20-30 years hardly more the possibility to find a traditionally dressed Ladakhi with prayer mill. 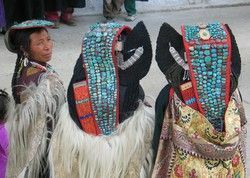 Nevertheless, in contrast to many other tourism areas of this world the Ladakhis have the luck that limits itself of the Touristenanstrom to the June till August. They have the rest of the year and in particular the winter then again for themselves. 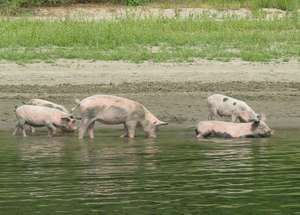 Thus they have enough time to recover from the "confusion" of the summer and to look after her families and her traditions. 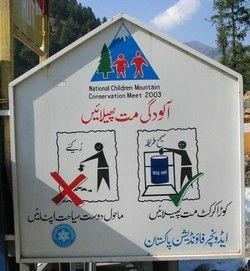 Child garbage congress (Pakistan): To keep clean an action around the environment. Unfortunately, there was in the whole place not a single one garbage can. But we have bespattered ourselves with our green point also not exactly with fame. 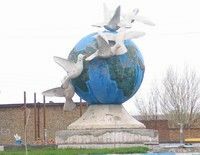 Doves of peace (IRAN): Maybe it is even a propaganda of the government, but the people it speaks from the heart. Cement mixing machine (AEGYTEN): Also so one can mix his cement: One shovels and andweren everybody moves in a rope fastened in the shovel around the shovelling to support. A method are loaded with the Lkw's whole in India by the way with grit. 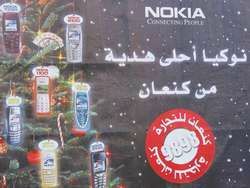 Merry Christmas (SYRIA): Thanks to Nokia we also have a Christmas tree. We find it over and over again frightening that even in so poor countries like Syria the mobile phone boom thus has hit. 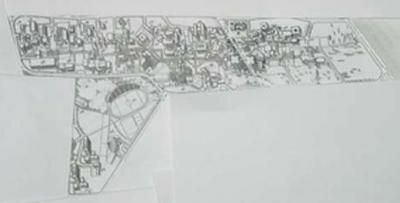 War knows no borders (TURKEY): This is the plan of the ODTÜ (Meddle East Technical University) in Ankara. 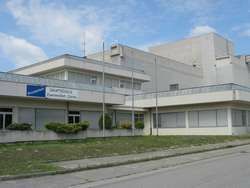 It was built in 1963 with strong support of the USA. Easily is to be recognised that she has the form of a gun. The run Showing in the direction of Russia. Quite incredibly that even a university was abused for the cold war. 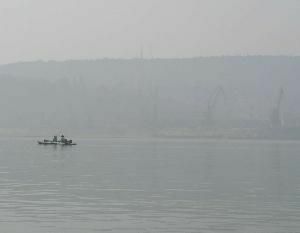 Smog alarm on the Danube (BULGARIA): The harbour arrangements of Swistov in the mornings about 11:00 o'clock with beaming blue sky. Next door there is a big industrial plant. We would like to know not at all only, how high the percentage of the lung sick person is in this town. Distance to the shore between 500 m and 1000 m.
Breaking bread (SERBIA): In Bogojevo we got to know very much clarify old Serbian custom. 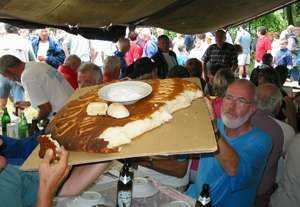 A big round flat dough-cake bread is passed by you round. Everybody all the same of which religion he belongs a piece of bread breaks off itself, it dips in salt, crosses itself (chrisdtliche religions) and eats it. Pity that one has not remembered this custom in the middle of the 90s. Then maybe the war would have been avoidable. 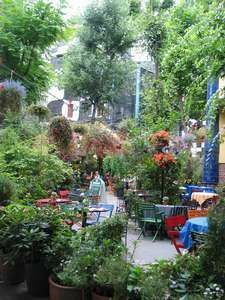 Hungary is wonderful land with a lot of nice people. Why you, however, her garbage simply in the scenery throw nobody presumably knows. The first night (GERMANY): Well, thinks so nobody has probably fancied our first night. 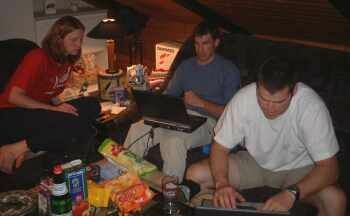 While Nadine has gone together with your mother on the birthday of your granny, here I sit with Alex and try to put together with Sandra and UFO the first daily reports in the net. Actually, a thing of ½ hours. Because the technology not so wants, however as we to seats we now for 3 hrs with 2 laptops here and are in do handicraft. If this is complicated always so then Cheers meal. Thank you Alex, Sandra, Peter and UFO. Farewell party:31.05.03 It could not have been a better farewell party. Thank you very much to You to all! Quite special thanks are valid Peter Grün and his tapes. You cannot fancy at all, how much I have been glad with the premiere of Peter's own songs to be able to be present. 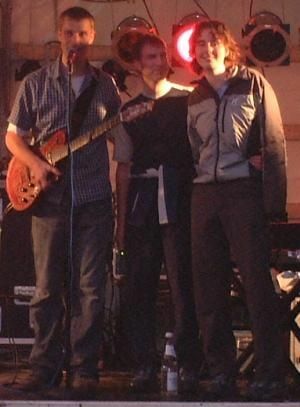 There are closer infos to Peter's new CD and his appearance as a pregroup of Nena under http://www.petergruen.de/. If his music points Him please as well is and tears to Him his CD from the hands. So once more many thanks for the nice celebration; we will still think back long to the evening.